A miracle for Aging Skin – The various abilities of peptides make our Peptide Vitality Collection an absolute miracle for aging skin. Infused with strength to prevent and overpower the breakdown of collagen and paired with their exclusive ability to plump and smooth, peptides are proficient at filling in fine lines and wrinkles from inside the skin. This is an extraordinary development in skincare that is available from DermaQuest in unique and effective blends. Nourish and rejuvenate aging skin with our antioxidant-rich peptide cream that is infused with natural anti-aging plant extracts. Stimulating peptides encourage cellular growth and collagen production and restores your skin back to its youthful glow. This is a desirable rejuvenating cream that is perfectly suited for normal to dry skin. DermaQuests’ luxurious moisturiser helps restore skin back to a smooth, youthful glow. Infused with advanced peptides, CoQ10, and fatty acids, start to eradicate fine lines and wrinkles as skin tightens and firms while free radical damage disappears. This is a luxurious moisturizing cream that works fast and is ideal for drier skin types. 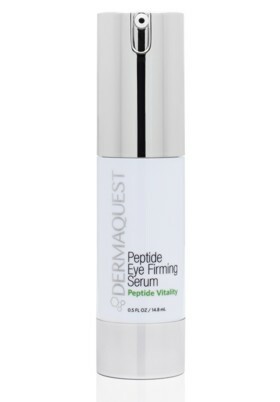 The DermaQuest Peptide Eye Firming Serum is ultimate solution to aging skin around the eyes. It pairs valuable collagen with elastin production to fade fine lines and wrinkles. Minimise dark circles and reduce puffy eyes with this gentle moisturising serum that has been mindfully formulated for the delicate skin under the eyes. For noticeable wrinkle control and improved elasticity, our Peptide Line Corrector revives and will soon reinvent your skin. Fine lines and wrinkles will be effectively filled in from within as our 60% peptide serum works on the cellular level outward, plumping and rejuvenating your skin. Peptides also encourage collagen production for supple skin that glows. 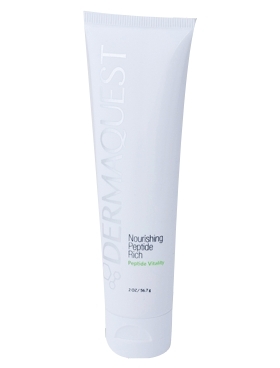 This combination of retinol and peptides have an impressive restorative influence on the multiple layers of our skin. 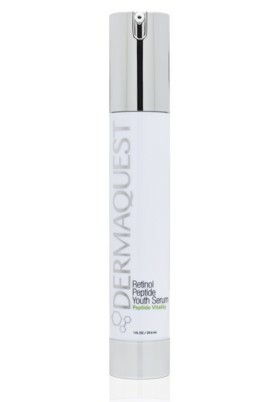 The Retinol Peptide Youth Serum encourages collagen and elastin production which successfully encourages skin to firm while filling in fine lines and wrinkles. Your skin will feel softer, smoother and appear clearer from the inside out as pores will diminish in size and a new you will shine through. 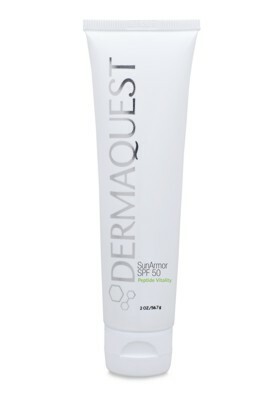 Bursting with peptides, DermaQuests’ SunArmor not only prevents your skin from solar damage, but it also helps to recover and revitalise your skin too. Featuring an SPF of 50, our nourishing sunscreen protects you from the sun while soothing fine lines and wrinkles and preventing future signs of ageing that can be caused by the sun. 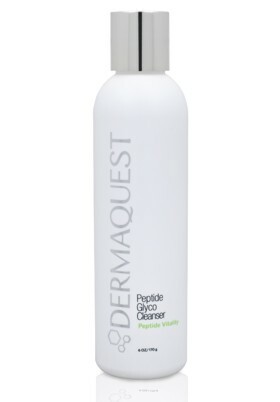 Reduce the signs of aging with DermaQuests’ smooth and velvety Glycolic Acid based cleanser, boasting the supreme power of peptides. Exfoliating and pore refining, our cleanser leaves your skin smooth and fresh with a beautiful glow.